Attempting to get non-for-profit community (solar PV) energy projects together, undermined by whiplash changes in government support schemes. How a few people (associated with Transition Town Kingston) tried to put together a community-owned renewable energy system circa 2012, initially based on solar PV. I am hugely in favour of distributed solar PV as part of the UK's energy mix, and indeed wish we had more like German levels of build out! I have filled a few roof areas with PV with my own money, and had a hand a a couple of others going up. I have been working with a couple of other members of the Transition Town Kingston Energy Group (Liz D and Peter M) on trying to establish one or more community PV schemes in Kingston. We're not ruling out other forms of renewables (eg hydro) in future, but PV remains one of the most urban-friendly microgeneration technologies. Liz D had done most of the leg-work up to our super-secret meeting of 2012/09/05 in Peter's back garden in lovely sunshine, and is still the driving force! The name is simple and nmakes clear the intent. The name is unlikely to be offputting to most of its potential audience (though visiting Tea Partiers might be discomforted I suppose). The name avoids leaning on TTK. The name doesn't preclude non-solar-PV microgeneration. We'd want some kind of legal vehicle for KCE that does not impose undue burdens (eg of liability) on those running it, which suggest some sort of company structure. We want to keep complexity and admin costs down. Liz' researches suggested that some form of IPS (Industrial and Provident Society) without charitable status would probably be the way to go. Liz' researches also indicate that some sort of "bencom" (society for the benefit of the community) would suit us better than a co-op. A "bencom" can apparently pay something like a modest (~4% max?) dividend, but called something like "share interest" instead. The bencom apparently cannot solicit for shareholders but must be able to advertise somehow. As mentioned above, we're not clear if one or many legal entities would be needed to take multiple roof spaces or multiple rounds of install or different sorts of contract with different landlords (eg roof-rental vs JV), and we're going to do further research on this. Our suspicion is that each investment round would need a new company but could cover a pool of projects. Liz has been working with a nominal switch-on date of October 2013, and we're all still happy with that for now. We've guestimated initial creation of correct share offer paperwork (with offer of free review for bloopers from a chap at Wessex Community Assets) at £200, company formation another £200, and accounts costs per year (at least until doing anything significant) another £200 per year. We have some model rules as used by OVESCo and Low Carbon West Oxford. 25kWp of interest from from roof owners (~200m^2 pitched roof space) before spending any real money. A minimum pool size of 50kWp of available roof and a maximum of 100kWp for the project (at least first round); ie we aim to raise funds for 100kWp but make sure things are viable down to about half that. Our aim is to use roof space within the boundaries of RBK, though we might allow ourselves to be tempted by some nearby. I was keen on houses, the others less so. I don't think it need be omitted at the moment - The Rose is surely commercial as well as community. I guess we were trying to focus on places that might have a network of people who could invest attached to it - which might make raising the funds easier. Which doesn't rule out business/commercial - but perhaps they don't automatically have people with vested interest in the building in the way that schools do other than employees... and depending on the company the employees may/may not be so engaged. We went and visited a local school today which looks like it has room for somewhere between 15kWp and 25kWp (crystalline) capacity facing ~SW on a shallow pitch, for maybe 12MWh--20MWh/y output at first blush. The school business manager seems happy in principle (no commitments yet!) which might give us the ~25kWp sanity-test minimum mentioned before, though I think we are agreed that we should have more than one potential roof in our portfolio in case of glitches with any one site. We've looked at a church roof (or at least buildings in the curtilage more likely to be acceptable from a conservation point of view), and a pub roof, and had long conversations with people such as Abundance about, for example, use of debentures to bring the minimum investement down to as little as £5 and allow gifting, eg to every child in a school. 2012/10/24: Liz has prepared a 1-page flyer explaining the idea. For schemes needing CAPEX up to about £200k an IPS is probably the best route; for £1m (or a bit less) and upwards a plc with public offering may work better (and fits Abundance's model). It should be easy to find roofspace in Kingston to fill up an IPS, a plc less so, thus starting with an IPS may remain the right thing. Bruce/Abundance offered to help one way or another whichever route we take (thanks!) as he is local and has broadly similar aims in terms of community engagement with energy issues. The idea of the £5 gift to each child is still in favour, and KCE may form legally sooner rather than later, probably as an IPS, to be able to engage with any positive publicity if this happens. For churches there may be a pot of £1m per CofE diocese available from the Church Commissioners for low-rate loans to support renewables works. We need to pin down the rules/aims of the IPS and the legal structure. Aim to do this by mid December so that we can get registered in early Jan.
Do the Wessex CA model rules allow multiple investment rounds? If not are there other model rules that do? All to review model rules, Liz to research further. Need to ensure that the IPS we set up allows us to convert to [Damon: or coexist with] a plc at a later date should we decide to. Agreed to start small with 1 or 2 primary schools and maybe a pub and then grow further roofs/buildings in future. Liz to send a note round to the energy group to explain where we are so far and find out if others want to be involved - chip in financially, be a director, any other way. Damon to approach about three solar companies at this stage to discuss the project: including Southern Solar, Evo Energy and Paarl. We decided that the £5 gift to all children at a school is probably not going to be compatible with round 1 of this project but we may do it anyway (eg with money going to another worthy project) for general awareness-raising, school and KCE PR, etc. We are all aware that the big hurdle is going to be raising the money. We will work with Abundance on this, they will host us on their site (need to find out the cost) in addition we will need a local marketing effort. Continue to look out for someone with communications experience who can help us with this. We will have to be careful to ensure that we don't break any of the FSA rules on selling shares, but still manage to communicate about the project to the local community. We may need some advice from a lawyer on this in due course. IPS BenCom is our preferred structure. We will set this up. Limits on the amount shareholders can ask for their investment back; 180 days to make a decision, leave it to the directors discretion if there is money available to pay people back. Asset lock that's less formal than an asset lock. We don't want the company to be wound up and sold off for jacuzzis and champagne, but equally we don't want to bind the directors to be forced to do something that's harder than necessary in the event that the company winds up. Ideally we would hand over the assets to the school, but they may not want them, is there another suitable local organisation? Brixton Solar? Or a category of company/charity such as A.N.Other community energy group? Liz to check the exit [cost], how much would it cost if we set up the IPS BenCom and then decide it's wrong and close it down again? IPS BenCom - to register with the FSA through an existing body (Wessex CA or Co-operatives UK) costs £45 using their exact model rules. To change up to 6 rules cost goes up to about £120. We aim to have a set of model rules that the three of us are happy with ahead of the meeting on 7 December (ie this week! ), coupled with the cost of registration so that we could register the IPS on 8 December if we get backing from the wider TTK energy group. an agreement with LA whereby KCE installs the panels and gifts them to the LA/school in exchange for guaranteed FIT income from the panels for 20 years. Damon to sketch out this type of agreement. A flying wayleave or similar, like a gas main. Model to deliver solar PV - we have our legal proposition with the school, which we can explain in detail - but we need to make them aware that they could still do it themselves with our help... especially given that we now have outline costs and system sizes from a couple of installers. They could seek crowd funding from parents, teachers etc. Agree that we will draft a letter of intent for all parties to sign discuss with them how we could promote the scheme to parents and teachers in the school and whether we could use the school as a venue for a public meeting in the future should we need one. Discuss the challenge of ensuring that parents and teachers don't see the solar project taking anything away from the delivery of teaching and learning at the school. Show them the quotes and discuss any potential challenges with where the installers have proposed to install PV. We will need a letter of intent that sets out the intention of the project between the chair of governors, RBK assets team, KCE and the head teacher. This is not a legally binding document but a sharing of vision for the project and commitment to work towards achieving it. We don't need a lawyer to look over this, we can draw up something suitable ourselves. When the time comes Damon will draw up a draft. See what the model says about still providing the electricity for free to the school, which would be our intention if we can make it work. Assuming for the moment that RBK would not seek a financial return from any PV mounted on one of their schools beyond the school getting free or cheap power, then if RBK remains against roof leases and cannot have its mind changed quickly enough for KCE purposes by local politicians, then as mentioned above one strategy might be to have full or part ownership of the PV system with RBK (directly, or in some kind of trust, or RBK takes a stake in KCE) as part of a contract transferring all FiT income to KCE, using power generated on site (free or cheap per kWh) and under which KCE contracts to perform any required maintenance on the PV system itself, eg inverter replacement. In this case RBK would probably avoid any leasing at all. Another variant may be to have ownership set to transfer to RBK (or successor) after the FiT period and investors are repaid, and have the IPS wind down. The basic point is to swap ownership of the PV system itself for a guaranteed stream of revenue (eg the right to the FiTs) instead. Whether a lease is involved or not it would be important to take model clauses from other places to allot responsibility if the PV system damages the roof or vice versa, or panels need to be temporarily removed to perform other works, or if for some reason the building or roof needs to be brought down, especially before the end of the FiT period. Free or charged for electricity: we would prefer to give the school free electricity as it is simpler, there will be no need for a PPA (which has legalities, costs and time pressures associated), however we recognise that the interest repayments for investors will be quite low in this case. We could propose to the school that we adopt an open book approach where we agree to set a minimum return to our investors and if the panels fall below that minimum return then we ask the school to share some of their bill savings with us. This potential shortfall could also be met through a periodic small payment from RBK in lieu of a PPA - the council could pay for the right to our free electricity. In whatever actual model we adopt we will ensure that the school/council pays less for the electricity produced by the panels than they would do on the open market. Liz to do some more analysis looking at what level of interest repayments might work in 0.5% increments between 0.5 - 2.5%. Repayment of capital: we agreed that we would like to give an option for repayment of capital to shareholders as we go along. The capital available for those who opt to not receive repayments can be used for investment in other schemes. We would like to avoid being subject to the vagaries of interest rates and so not retain too much capital. Also it reduces the problem of people coming to us wanting their money back if we give it back to them as we go. Obviously in a given year we won't repay capital until we have paid for all the company operations (panel maintenance, accounts, data collection and processing for FITs, shareholder interest, etc) plus accurals/reserves. What happens to the asset at the end of the project: we would hope that we can give the solar panels to RBK/school as they will have a number of years of valuable productive life left in them. We may have to write off the very last bit of capital repayment to shareholders in order to make this happen. We would like to know what the primary school are currently paying for their electricity and how much they use - so that we can estimate the potential savings and model accurately the council repayment option. Peter to try and get hold of bills data. Negotiations with the council: we need to further the discussions with the council about using the roof of the school, roof lease or similar. Damon to follow up with Marcus from RBK. If we get stuck with the council officers, we also have the support of Sharon Hartley - lead councillor for env and sustainability to help to push things through. Early finance: Liz to draw up a letter to go out to TTK energy group and TTK management group to ask for financial help to get the IPS BenCom set up. We need £670+VAT to register and we may need a little more for legal support from Co-operatives UK for the clauses we want to change. We will ask for £1200. Business plan: we need a short 2-page business plan to summarise our project - Damon will send it to Lucius, we can send it to Abundance and Carbon Leapfrog to get their help. Liz to draw up a 2-page business plan. We had a very productive meeting with Nia P-W of RBK today, at which we showed her our draught business plan and risk register. Interestingly, a major concern was that she thought our CAPEX numbers too low, but PV costs have dropped rapidly over the last year so I still think that our numbers stack up: we will in any case try to formalise and firm up quotes for the work to be done before 1st May when the tariffs drop again. Today I sent emails to local MPs Ed Davey and Zac Goldsmith to see if we can have their support, as getting it will make it easier for RBK to say yes. We're also working on local councillors and so on for the same reason. Zac Goldsmith responded 2013/01/05 with: "I'm very pleased to see Kingston Community Energy's effort to install more solar PV to help cut emissions and energy bills for a local community school, and I wish it the very best of luck. We agreed to put our risk and task registers on line and make (and keep) them public as far as possible (which my require a little anonymisation for now). I (DHD) went back to the 4 solar companies that gave us outline quotes primarily to ask them to give us timings to help with project planning for a mid-April install (for school holidays, and catching current FiTs). We prepared a meeting agenda and LOI for the school, and will prepare a project status 1-pager that will be both for the school and for RBK (Nia P-W). I am preparing our standard document set, both off-line snapshots and our public on-line/working copies. 2013/01/11: I confirmed over the phone with RBK Building Control that as long as we use installers within the right competence schemes (eg MCS installers, Part-P electricians) then BC does not need to be involved. An email exchange with Ecotricity today (2013/01/11) says it is willing to be our FiT administrator and that it can lift its usual 50kWp scheme limit. (If we go over 50kWp total then because Ecotricity does not participate in the ROOFIT scheme for 50kWp+ systems we would have to register as more than one system, eg system+extension.) A call to Good Energy confirms that they do operate ROOFIT and would be prepared to be our scheme administrators also. Given the above it occurs to me that we might optimise the finances by first putting up a 10kWp system on the flat roof with optmimum generation per kWp, and a the 10kWp tariff band. Then we could put up 40kWp as an extension, depending on money raised, to take us into the 50kWp tariff band for that second part alone. Then if we still have funds left we do a third round right up to the capacity of the roof and our bank account which would achieve the sub-250kWp tariff band return. Ofgem rules may prohibit such segmentation, but if forced to do it anyway because of ROOFIT issues, then it might improve our returns a little. The school is not in a conservation/WH/AONB area so GDPOs apply. If we ensure that none of our equipment is closer than 5 metres to the edge of the curtilage nor closer than 1 metre from the edge of the roofs we build on, nor raises the existing overall roofline of the buildings, that we will be within GPDOs (there are several buildings clustered together, with a 'tower' that we don't intend to put solar on that has the highest roof). I am also emailing Ofgem to get details of the communities and schools EPC exemption (ie so that the actual EPC rating does not affect the FiT tariff), and to check the right way to do a PPA with the school from a regulatory point of view. We've had a very positive response from RBK today, which while not in any way permssion yet, is supportive and says that the two officers so far involved have no issues in principle with our project, and urging us to get on with sorting out the legal agreements. Also had a call back from Southern Solar, sounding flexible about payments, timing, etc, which is all good. We'll still plan for the most straightforward full permission, full fundraising, full install, in that order, before 1st May, but flexibility seems to allow lots of room to tweak various aspects to improve returns all round. Enviko sent a helpful email, including a document on GDPOs. If I've interpretted the document correctly, the implication is that the highest part of the structure on the flat roof cannot be more than 1m above the roof. Depending on the dimensions of the panels and layout we use, that might constrain us from getting optimal tilt and thus optimal kWh/kWp/year, which we should bear in mind. We had a positive meeting at the school with the people we've dealt with before plus the head and a governor, and will be sending them through more details of the overall plan and links to the background calculations and so on. I hope to take the governor to see the installation at King Athelstan soon to get some idea of what one might look like. The SEIS scheme may not be renewed in April when it expires. Getting a second round of investment can invalidate previous (S)EIS status. What are the liabilities for KCE in the lease agreement? Is it limited liability? Or are we open to a lot of liability? Liz to check. Do we or do we not need to employ a lawyer to get the lease agreement through the council? Liz to ask Nia what she thinks. Liz to look at if we can fundraise for the money to pay for it. Liz has already applied to Carbon Leapfrog so we might be able to get pro bono legal support for this. Is SEIS for normal rate tax payers, or just high rate? What is the lower limit of share investment going to be? Should we set a very low limit so that the kids in the school can genuinely be involved (£20 or £50)? There is an administrative burden to having lots and lots of low paying shareholders — but it then becomes genuinely about the community being involved. Liz to look into what other schemes have set as their lower limits — particularly the ones with a very low lower limit? Why did Brixton and others choose £250? How much does an individual bank transfer cost and at what point does it cost us more to pay the interest in bank transfers? Brian S comments on the spreadsheets — sensitivities are how much electricity that the school actually uses, what is included in the maintenance costs and whether we've made it too high, how capital allowance is treated, can we depreciate the asset (panels) over 20 years and spread the maintenance costs over 10? In which case it reduces the corporation tax burden? VAT — can we voluntary register? Should we register and then deregister? Liz to try and understand what this means! Dave G agreed to be company secretary. Liz to check if we can have 4 founder directors and include Hilary G in the list of directors. Liz, Damon, Peter and Dave signed the paperwork. Liz to do final checks that everything is correct and then send back to cooperatives UK for registration. Ham Hydro — how can we work together — they are looking to set up an IPS now too. Peter to set up a meeting with them. Kingston Community Energy is finally registered! Thank you so much for your help (guidance, advice, finance, etc) in getting us this far. No stopping us now from getting solar panels up across Kingston! Does a smaller system compromise the project? We can only sensibly install 25kW at school 2 - but to absorb the overhead within one single 25kW sytem will kill the project financially. So we need to find other ways to pay for the overhead or spread it over more than one install (carbon leapfrog, pro bono from others). Liz has set the investor interest payments at 3% in the analysis. Abundance: unfortunately they cannot provide us with financial promotion backing for legal reasons, but they will be able to promote our project through their website. School 1: if there was a grassroots movement from teachers and others in Kingston to get them to change their mind we would still be interested in working with them. But for now we will let it go and move onto another school. Liz to see if she can make contact with those schools who are taking action during cliamte week. Carbon Leapfrog has invited us to interview on 20 Feb.
Cllr Craig, schools portfolio, offered to talk to local schools about the project to open some doors for us. We are looking for a school that is performing well with an established head teacher. We agreed to aim for 100kWp in our first phase. 25kWp on current target school plus one more school ideally. We agreed to set the modelled investor return at 3% and base our rate of sale of electricity to the school on what works with a 3% return. We selected a logo - I canvassed a few more opinions and will canvass some more tonight at the TTK meeting. Liz to go back to graphic design man regarding colours (red/green/yellow). Follow on: KCE now registered with the FSA! Action for somebody: to set up a bank account with an ethical bank (unity bank had the best deal for transaction charges in my very brief search). Damon to set up domain name. Meeting with Carbon Leapfrog on Wed 20 Feb. Note: kce.org.ok set up for Web/HTTP. Note: Carbon Leapfrog agreed to support us following the meeting. We had a good meeting with Alex G of Carbon Leapfrog. Lawyer to assist with sign off of the lease, we are using CL template lease with slight tweaks. Sign off of marketing prospectus, is there a way to develop more of a template with CL? Dos and don'ts for SEIS - how to make sure we get it and keep it, CL to develop a crib sheet for us. Dos and don'ts for IPS comms - making sure we don't fall foul of the FSA regs around IPS's and financial promotion - a crib sheet or words to use in our communications would be ideal. Paperwork done by end of April (lease agreements and marketing prospectus). May - June for fundraising. Need to find some new ways to increase our funnel of potential schools; avenues to explore include 10:10, P (chair of education RBK), RBK climate change team, bursar to bursar and chair of governors to chair of governors (starting from KA), advert in project dirt, local press, Freecycle/Gumtree for suitable roofs. See notes prepared by Liz. See also outline propectus for discussion. Yesterday Liz and I went to visit a Kingston church that has some money to put up solar; we were able to offer them some technical guidance, and we've said we're happy to do more without getting involved in the money. We care about getting PV put up rather than empire-building! Also, there may be space left over from their project onto we we could spill any extra PV if we slightly overachieve on fund-raising for another project. The church would be happy for us to mention their name as a project once everything is done. Peter and I went to talk to the managers of the Kingfisher leisure centre in Kingston to see what we might be able to do there. Management (and longevity) of the roof is not entirely clear at the moment, so initial thoughts are to look at using PV to provide some screening in shoulder months to avoid glare (which otherwise requires extra lifeguards) and overheating. Submitted proposals to three schools and a couple of churches at varying levels of detail: none taken up to date. Became members of Carbon Leapfrog (now Pure + Leapfrog) for professional services where required. Advised RBK Assets/Property departments on installing solar PV on all RBK estate including schools, including commenting on terms of reference for bidding documents for feasibility study. Have joined SWLEN and assited in energy audits of domestic and community buildings leading to propsals for installations at a church in Richmond and a community centre in Hampton. Created Web site that has had appreciable interest from the general public. Had helpful meetings and interactions with Abundance on financing. What can Hilary take to RBK as councillor? PV on the RBK estate. Heat-pump (eg water-source from Thames and Hogsmill). RBKingston should maybe bid for green-tech cash/events from DECC/TechStrategyBoard/etc, not just leave it to Shoreditch! Should we join CEE 'trade association' for orgs like KCE? Free with current zero turnover: 2 voted for, 1 neutral. Speak to new FH acting head over summer to try to resurrect PV plan. £1k is available from RBK grant: have to find appropriate equipment. Make sure camera gets thoroughly used, eg aggressively lend it out. PM do next round of camera research, with MB and DHD. After an extended period of inactivity it has been proposed that KCE is closed. This is our standard document set for the project as of the start of 2013, and will contain a mixture of live/public working copies and snapshots. Today the five members (including the four officers) signed the documents to dissolve KCE in front of a solictor (for free: thanks!). 2014/06/08: Brian Shindler and Damon Hart-Davis talk to Sam Hermitage about the benefits of community energy including solar panels installation, Feed-In Tariffs, Being carbon neutral, energy storage, tips on Insulating, superhomes, TRV's and Infrared parties. 2013/01/09: What rate of return does it take to attract money into community renewable energy? This suggests 4% for small projects (under £200k), 7% for larger ones. 2012/12/13: The seven deadly sins of social enterprise. 2012/11/19: Community-owned solar: Like drinking milk without caring for the cow. 2012/10/10: Schools chalk up funding for new solar panels: 10:10 campaign unveils next phase of Solar Schools initiative will involve 30 schools. h2ope projects and two types of investor, ie ordinary 'unsophisticated' retail vs high-net-worth. Ovesco IPS community-owned renewable energy. HMR&C Seed Enterprise Investment Scheme (SEIS) rules. FSA page on IPSes (Industrial and Provident Societies). DECC's [now BEIS'] Community Energy Online Portal. 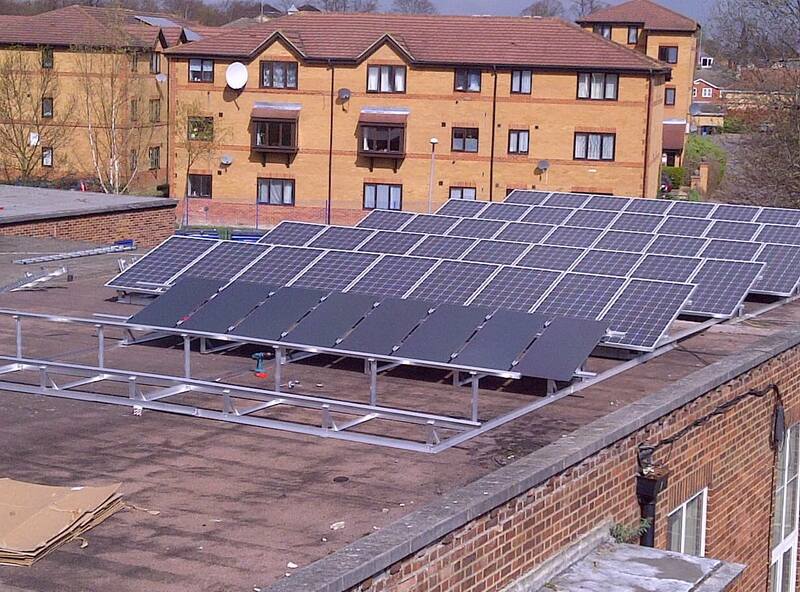 [C/o WayBack Machine] Oxford North Community Renewables (ONCORE) is an Industrial and Provident Society set up to fund the installation of solar photovoltaic (PV) panels on the roofs of The Cherwell School. First published 2012-09-07 , updated 2019-04-22 , rebuilt 2019-04-23 . Site copyright © 2007-2019 Damon Hart-Davis. Hosted by ExNet.